In Gaithersburg, carpet cleaning is a vital step in protecting your valuable flooring investment. Your carpet acts as a filter for dirt, mold, and other pollutants, helping to keep the air in your home healthy. Carpet cleaning from Home Maid Service Inc. can provide significant health benefits and extend the life of your carpet. Many residential carpets are designed to disguise how dirty they are. While you may think that your carpets are clean, they may actually be disguising dirt, stains, and soil, unlike hard flooring that indicates when maintenance is needed. Our experienced carpet cleaning professionals can set you up with a regular cleaning schedule to keep your flooring looking great. 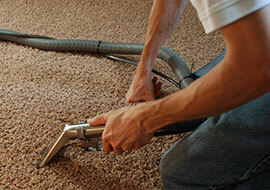 Regular carpet steam cleanings should be included in your home cleaning plan. Soil and dirt do not only affect the appearance of carpeting, but the abrasions that they cause to carpet have been proven to be the one greatest contributing factors to premature fiber damage. This type of damage is irreversible and is one of the biggest contributors to carpet replacement. With one call to us, you'll discover why more people in the local area choose us for high-quality carpet cleaning services at an affordable price. You can depend on our carpet cleaning company! For more information or to schedule your appointment for service contact us today! We are committed to offering the finest carpet cleaning in town! Our highly trained staff is dedicated to providing you with fast, efficient carpet cleaning that fits your schedule and your budget. Plus, we work hard to get your carpet cleaned right the first time. With this unique approach to carpet steam cleaning, you'll rest easy knowing that your home has been cleaned to meet your satisfaction. Our team follows manufacturer recommended methods for deep cleaning to make sure that your carpet is cleaned the right way. We have experience cleaning all types of carpet stains and spots and stains, working hard to remove tough stains and smudges. No other company is as dedicated to the cleanliness and health of your carpet like we are! To schedule an appointment for carpet cleaning, contact us today! Contact Home Maid Service Inc. to schedule your appointment for carpet cleaning. We clean homes throughout Gaithersburg, Rockville, Germantown, Urbana, Clarksburg, Silver Spring, Chevy Chase, Bethesda, Monrovia, and Olney, MD.